Women who eat more berries could knock a couple of years off their “brain age,” according to a study in the Annals of Neurology. “The bioflavonoids in berries seem to protect the brain from the effects of aging, presumably by decreasing inflammation and providing the brain with powerful antioxidants,” said lead study author, Dr. Elizabeth Devore. Bioflavonoids, sometimes just called flavonoids, are compounds that give plants their characteristic colors. Deep blues, reds, and purples come from a type of bioflavonoid called anthocyanidins. Berries are especially rich in anthocyanidins. Scientists are still trying to figure out exactly how bioflavonoids work, but we do know that they are powerful antioxidants, they can limit inflammation in the body, and they are involved with how cells communicate with each other. Some studies suggest that the anthocyanidins in berries might help preserve cognitive (brain) function. Women who took part in the Nurses’ Health Study were invited to join a branch of the study that looked at berry consumption, thinking (cognitive function), and memory. To measure this, more than 16,000 women 70 years of age and older took a series of tests twice, two years apart. Blueberries and strawberries accounted for most of the anthocyanidins in the women’s diets. Women who ate the most blueberries (one or more ½-cup servings per week) had significantly slower rates of cognitive decline compared with women who had less than one serving per month. Women who ate the most strawberries (two or more servings per week) had significantly slower rates of cognitive decline compared with women who had less than one serving per week. Cognitive aging appeared to be delayed up to 2.5 years in women who ate the most berries, meaning that they had the brain function of someone 2.5 years younger. “These findings potentially have substantial public health implications, as increasing berry intake represents a fairly simple dietary modification to test in older adults for maintaining cognition,” said Devore. Berries abound in the spring and summer months, making it easy to find fresh, local fruit. During the rest of the year, frozen berries are the next best option. Berries are often sprayed with pesticides, so people who want to avoid residue should buy organic. Add some to oatmeal. 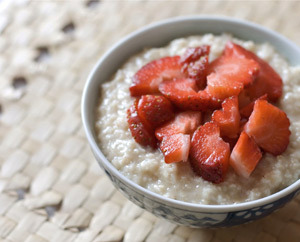 Chopped strawberries go well with hot cereal, and frozen blueberries help cool it down enough to eat right away. Mix up a smoothie. Frozen berries make a great base for any type of smoothie. Try 1 cup of berries, ½ cup plain yogurt, 1 chopped date, and a handful of grapes. Add water or juice to reach desired consistency. Toss them in muffins. Any type of berry makes most baked goods even better. For a tarter treat, try some chopped cranberries.